the iconic work of international designers massimo and lella vignelli is now permanently archived at the vignelli center for design studies, which opened earlier this month on the campus of rochester institute of technology (RIT), USA. the vignelli’s created the new york city subway signage, the handkerchief chair, the paper clip table, the stendig calendar, the interior of st. peter’s lutheran church in new york city, the corporate identity programs for xerox, american airlines, packaging programs for bloomingdales and saks fifth avenue, to name just a few. the center will serve as a hub for design education, scholarship and research, expanding the scope of the programs offered through RIT’s school of design. the school offers degree programs in graphic design, industrial design, interior design, new media design and imaging and computer graphics design. the university also has international exchange programs with anhalt university of applied sciences in dessau, germany, and in copenhagen, denmark. 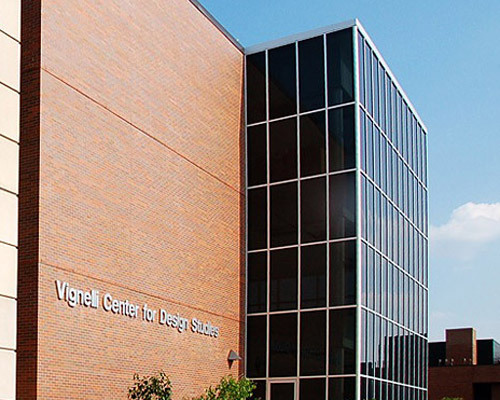 the vignelli collection complements RIT’s 35 collections of modernist american graphic design pioneers such as lester beall, will burtin, cipe pineles, william golden and alvin lustig, among others. the university began acquiring these collections in the mid 1980s. The underground map thing looks like the London underground map first designed by Harry Beck in 1933 and the furniture in the gallery…..what can I say…go study elsewhere. I hate so called star designers – whom I’ve never heard of – and get a design school named after them….what is the world coming to? @Dr. Design. Ignorance is bliss, eh? How could you possibly call yourself a doctor of design and not know who Massimo Vignelli is? It’s nice to read about someone like Massimo Vignelli who has accomplished so much in his lifetime. I do design work also and I’m inspired by people of Vignelli caliber. @Dr.Design – so let’s get this straight: you ‘hate” designers of whom you’ve never heard, but are p**sed that they get a design school named after them? So are you admitting your own ignorance or just hate the fact that someone else can design and you can’t? Which is it? FYI, I’ve never heard of ya.